Donald Trump, the 45th President of the United States, sounded off on Twitter about the Jussie Smollett case. Just two days ago local prosecutors in Cook County announced they were dropping all the charges against Smollett. That decision has rippled all the way up to the White House. Empire creator Lee Daniels went off himself on Instagram before knowing that the charges would be dropped. Lee didn't know what the future held as he said the cast was experiencing, "Pain, frustration, and anger". In the wake of Jussie having all charges dropped, we have yet to hear from Daniels on his feelings about the embattled actor today. One would also have to wonder if the creator of the popular show Empire wants any more drama in the form of Jussie Smollett being involved with the show. Before today's Trump Tweet the waters looked to be calming. After viewing the sizzle reel that ran during the Empire episode last week, it's clear Lee Daniels and Danny Strong are contenders to come back for at least one more full season of the show. Although no formal announcement needs to be made on an Empire renewal before mid-May, sources close to the series say that the revitalized Fox network knows the importance of the property so, there will "almost certainly" be more of the Lyon clan on Fox's airwaves. The question still burning is will Jussie Smollett be included in the deal? 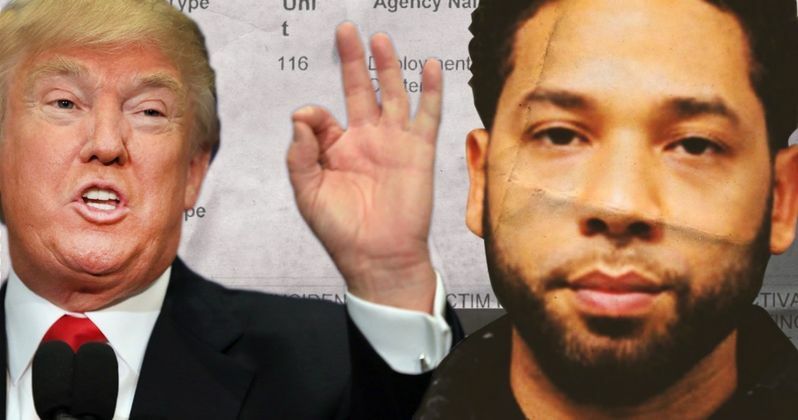 After being cleared of all charges two days ago, he seemed to be headed towards possible vindication in the matter, however President Donald Trump threw some cold water on Jussie tweeting this out today. This comes in the face of Smollett forfeiting his bond of $10,000 and doing 16 hours of community service to see his 16-felony count indictment go away. Amongst the 16 counts he was charged with lying to police in the staging of a hate crime in which he claimed to have been the victim of a racist and homophobic attack while returning late one night to his Chicago home. Investigators concluded Smollett set the whole thing up paying two bodybuilding Nigerian brothers $3,500 to accost him, allegedly in a misguided attempt for sympathy and a pay raise. Smollett's initial version of events used a slogan of President Trump's, as his alleged attackers were cued to say "This is MAGA country," while assaulting him. MAGA country is a direct racially polarizing reference to Trump's Make America Great Again campaign slogan. Maybe after hearing the many officials including Chicago Mayor Rahm Emmanuel and Police Superintendent Eddie Johnson expressing their outrage, Trump decided to jump in the fray for some publicity. In a widely watched press conference the two called the decision to let Jussie off the hook a "whitewash". With Trump today calling for the feds involvement, getting away might not be as easy as it was in Cook County for Smollett. Jussie is still facing a Federal charge of Mail Fraud for a threatening letter he supposedly sent to himself on the Empire set. This news was sparked off by the official Donald Trump Twitter.